It's vacation week! So, I'm quilting. My other passion! These blocks are samples from a book titled The Farmer's Wife. The book includes letters from 1920's farm wives and the quilt blocks they inspired. I have been working on this sample quilt for a couple of years now. It is a true labor of love. I only have 50 blocks made, they are 6" each. I'm hoping to at least double the amount of blocks by the time I am through. We'll see. Sample quilts can be challenging. I know I will not use all the blocks I make. Some I will decide are beautiful but won't match the others. You would think I'd figure that out along the way! That's part of the challenge that I enjoy. The blocks are being auditioned on my quilt wall where I can look at them, rearrange them and carry on! I haven't been working on this quilt exclusively. It would be too frustrating to not complete a quilt once in a while. So I revisit it when the spirit moves me. It's been a joyful experience so far. It's back to school next week so it will be time to put my needle and thread aside, hopefully not for long though! Labels: The farmer's Wife quilt. Sample blocks. 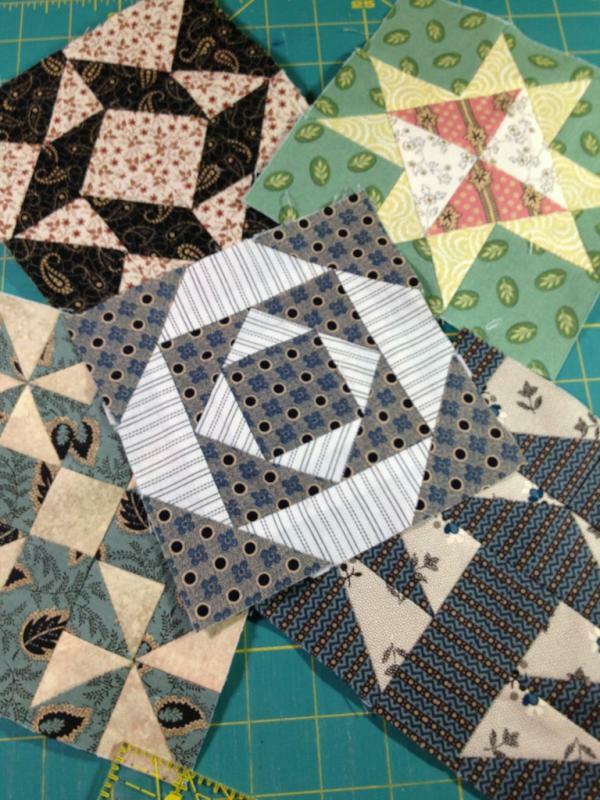 Quilting. I'll just bet that all of the Quilter's who have gone on the the great big quilting bee in the sky, are very proud of you for carrying on such a beautiful artform! "The great big Quilting Bee in the sky". That's a nice thought! Thanks Pat. If you need help Mrs. C when you tackle the Farmer's Wife blocks give me a holler. The patterns can be tricky. Glad to know so many art teachers also love quilting.